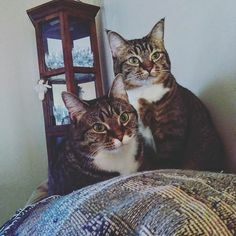 You are here: Home Adding a Second Cat To Your Family: Is Your Cat Ready For A Friend? Adding a Second Cat To Your Family: Is Your Cat Ready For A Friend? Late last year, a client sent an email asking whether I thought their cat Oliver would welcome a second cat into their family. Oliver is a mellow kitty, 8 years old, that they adopted earlier last year. He lived with dogs in his previous home, but there was no mention of other cats. Before moving forward, it’s important to consider: Can you and your resident cat handle adding a second cat? What is your schedule? Do you struggle to find time to spend with your cat now? If so, consider that the time you have would be split between two cats. Not spending enough time with cats can lead to behavior problems. Cats are good at letting us know when they aren’t happy. Once you add a second cat, keep in mind all expenses will double. This includes food, litter, vet costs to name a few. Will your budget be able to support adding a second pet? Before moving forward, be honest with yourself. Do you want to add another cat because you believe your cat will be happier, or do you want the cat? Make sure you’re doing this for the right reason before adding a second cat to your family. Once you’ve pondered the factors above, and have answers to all the questions, it’s time to decide what cat would make a good companion for your cat. If your cat is young, he would most likely welcome another young cat as a playmate. When your cat is older, no longer in the mode of playing 24-7, a young cat can be very frustrating to him. This can lead to problems between them down the road. Many people believe a kitten will make their older cat feel “young” again. They are then confused when the two cats don’t get along. For older cats, look for a cat companion that’s past the kitten stage and is calmer. Your older cat will thank you! In Oliver and Lola’s case, there’s been a mismatch of wants and needs. Lola, at her age, is very active and wants to play continuously. Oliver, on the other hand, wants to play occasionally, but when he’s ready to stop, Lola isn’t getting the message. I talked to Oliver’s mom the other night about the situation. At the time they adopted Lola, they liked her demeanor, and at her age (2 1/2 years) thought she was past the kitten stage. I advised she’s past a kitten, but as a young adult (would be around 25 in human years) her energy level is much higher than Oliver’s (8 years old, would be around 50 in human years). Oliver is becoming frustrated, as is Lola. Their people are hoping the situation will work out, but now realize rehoming Lola may be the best answer. They have a niece very willing to take Lola and offer her a loving home if it doesn’t work out with Oliver. Consider your cat’s personality, keeping in mind this is a case where opposites can complement each other. In my client’s case, Oliver is a mellow boy, but can be a bit fearful initially. If your cat is shy (as my Marty is), it’s best not to look for another shy cat. They may end up bonding with each other, but not with you. 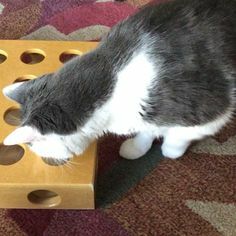 For shy cats, a good match can be a cat that’s age-appropriate, and a little more confident. Cats often mimic each other. Having a more confident cat around the house can help bring your shy cat out of his shell. Are you living with an extremely confident cat? Bringing in another like him can lead to in-fighting between them. Try a cat that’s more low-key to offset the extreme confidence of your cat. Once you decide on the “right cat”, it’s important to introduce him/her gradually to your resident cat. As I’ve said before, cats don’t operate on a timetable, so do not become discouraged if it seems to be taking a long time for your cat to accept the newcomer. I’m hoping for the best with Oliver and Lola, and will update this post as they happen. There are many great cats available for adoption. 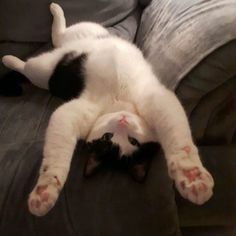 Check petfinder.com or adoptapet.com for adoptable cats in your area. Have you recently added a second cat to your family? Please leave a comment and let us know about your experience. We’d love to hear from you!